From the moment Tony Perez heard Jacque Keeslar bellow, he knew he was dealing with a different kind of character. 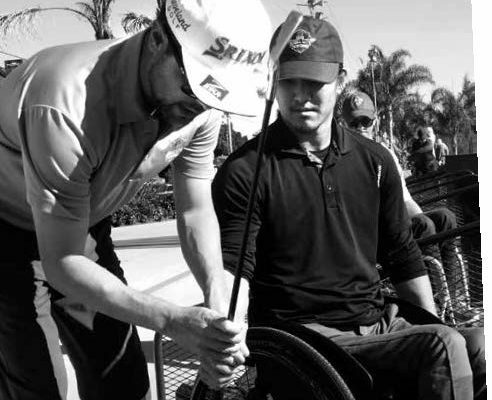 Perez had convened a handful of Wounded Warriors at the Balboa Park GC in San Diego to begin their lessons in the program he founded in 2008, Operation Game On. Mostly by word of mouth, Perez, the father of PGA TOUR player Pat Perez, enticed service members who had come back from wars in Iraq and Afghanistan with severe injuries, both physical and mental, to get out in the sunshine on green grass and distract themselves from their very real troubles. Jacque Keeslar, a double amputee who at the time was an Army Sergeant First Class, was neither shy nor very patient. Perez had no idea how much that would be true, or what Keeslar and his family would come to mean to him and other veterans as the years passed. 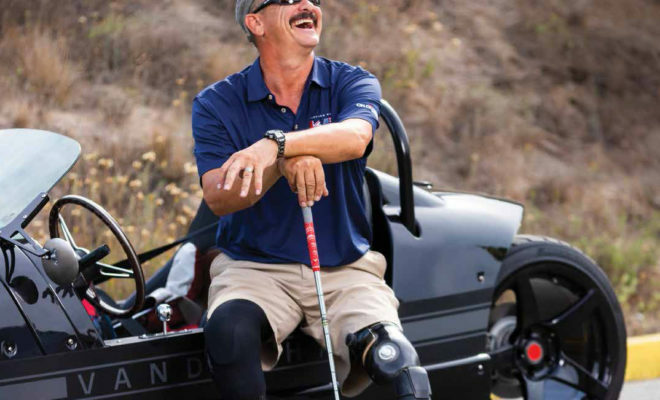 Today, a decade later, the 49-year-old Keeslar is among the most accomplished and visible Wounded Warriors in the golf world. 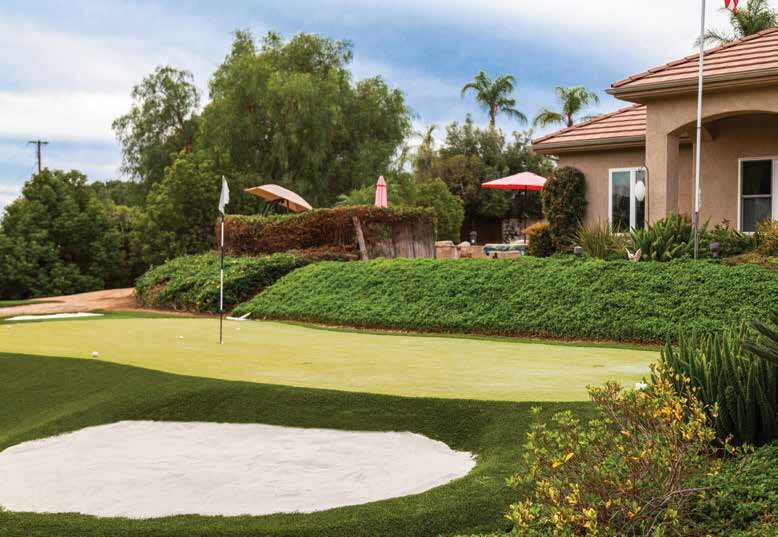 A resident of Fallbrook in San Diego’s inland North County, Keeslar has played in numerous tournaments around the country to raise awareness for veterans, including three appearances in the Bush Institute Warrior Open, which was founded by President George W. Bush. 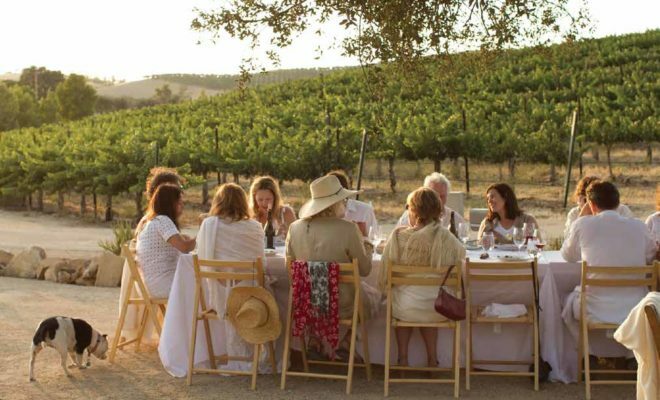 His wife, Vanessa, each year stages the Tradition Duel in the Desert, which brings together people from all military backgrounds with members of the Tradition Club in La Quinta to create friendships and raise awareness. Keeslar has rubbed elbows with Arnold Palmer and many other pros; he formed a bond with President Donald Trump; and in September, he earned his most treasured golf experience, going undefeated in an American uniform in the U.S. squad’s victory over Great Britain in the Ryder Cup-style Simpson Cup that is tailored for wounded heroes. Keeslar — whose first name is pronounced “Jock,” though he is most often called “Jake” — wears prosthetics on both legs. His left leg is amputated above the knee and his right leg below the knee. In June 2006, one month before he was supposed to return home from duty in Iraq, Keeslar was on a mission to eliminate a local terrorist cell in Anbar Province. The Stryker vehicle in which he was riding drove over an IED pressure plate, and the explosion pinned Keeslar against the vehicle’s gun station, smashing his legs. 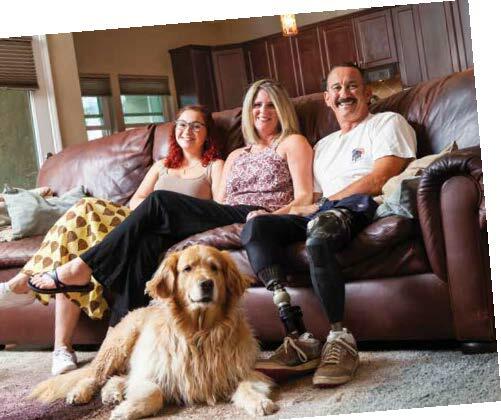 Evacuated by helicopter to a field hospital, Keeslar wouldn’t be aware that his legs had to be amputated until he woke up at Walter Reed National Military Medical Center in Washington, D.C.
“I realized that I was shorter than I used to be,” Keeslar once deadpanned for a film crew that interviewed him. Just as with his first golf lesson, Keeslar didn’t think he had any time to waste. There were rough times, to be sure. Keeslar spent about 18 months recovering at Walter Reed. To that point, he and Vanessa had been married only a couple of years, though they’d known each other since high school in Big Bear. A former 911 operator, Vanessa spent every day at Jacque’s side. Those were the times when there were so many wounded troops arriving at Walter Reed, it was like the “wild, wild West,” she said. A former wrestler and football player, Jacque wasn’t much of a golfer before being “blown up,” as he often refers to it. It was his prosthetist at Walter Reed who first got him out on a course, and the nature of finding balance in a swing while on various terrains was invaluable to his progress. Finding a swing was another matter. Without a left knee, Keeslar can’t bend his leg at address, so he keeps it completely straight, with his heel serving as an anchor. He bends his right knee, and from an exaggerated closed position, he takes a turn and makes a powerful move through the ball. It took hitting a lot of balls to not see a bunch of shots rocket off to the right. The Keeslars moved to San Diego in 2009 while Jacque was still on active duty. For five years following his injuries and before retirement, Keeslar monitored the care of Wounded Warriors at military hospitals around the country. He heard about Operation Game On (OperationGameOn.org) from other soldiers and showed up for Perez’s first class of a new eight-week session. 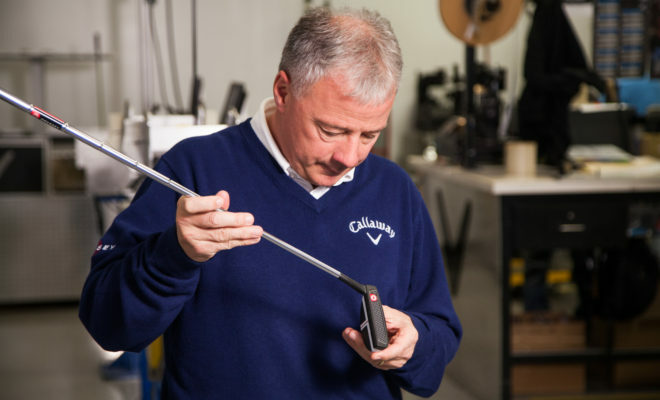 The program, now based at the Del Mar Golf Center, takes students through the basics, and at the end, the participants are fitted for clubs, free of charge, by TaylorMade. In 10 years, Perez said more than 525 troops have gone through the program. 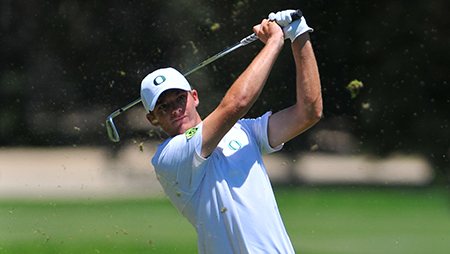 If Keeslar had some interest in golf before he met Perez, he was hooked after only a few lessons. “I would call it an obsession now,” Vanessa says with a grin. Jacque plays several days a week, rotating mostly between Shadowridge and the course closest to his Fallbrook home, The Golf Club of California. When he’s not playing, he’s hanging out with Vanessa or cruising around in his new toy — a black, turbo-charged, three-wheeled Vanderhall that seems part motorcycle, part dragster. On another occasion several years ago, Jacque and Vanessa were invited along with other military couples to a dinner at the Florida home of Donald Trump. 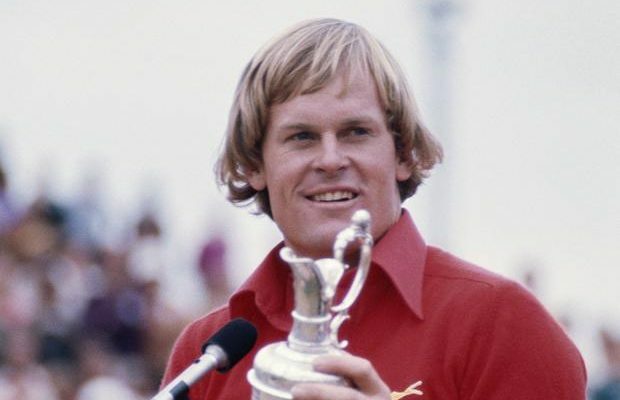 The businessman and Jacque hit it off, and Trump gave Keeslar his private phone number and told him to call anytime he wanted to play Trump National in Palos Verdes. Keeslar — remember, he’s not bashful — later made that call and spoke to Trump directly. After golf had been arranged, Keeslar recalled that Trump had a question for him.